BECAME THE SITE OF A FAMILY GRAVEYARD. THE ORIGINAL CEMETERY COVERED ABOUT AN ACRE OF LAND. THE SMALL COMMUNITY WERE EVENTUALLY INTERRED HERE. ELEVEN ORIGINAL HEADSTONES REMAIN IN THE CEMETERY. MARKED WITH BOIS D’ARC WOOD MARKERS. SON AND DAUGHTER-IN-LAW, THOMAS T. (D.1881) AND SARAH J. SIX-MONTH OLD WILLIAM B. PULLIAM (D.1863), AND SUSAN R.
TO COLLIN COUNTY RESIDENTS OF THEIR AREA’S HERITAGE. Bradley was 55 and the father of five grown children when he arrived in Texas. At 59-years-of-age, he volunteered for active duty and served for six months as a private in a local army regiment during the Mexican War of 1846-48, riding the border of the “Indian Frontier” of that era – an area just west of Fort Worth. Some reports indicate that Bradley lost a leg during the war, but this may be more legend than fact. Sunday was one of those beautiful November days when the sun shines bright and the air is laden with the harvest perfume and its tang of approaching winter – when one who had caught the spirit of roaming can walk for miles without fatigue with every moment filled with sweetest joy. We walked through fields of corn and cotton, pastures of richest hay, down thin ravines where the rabbit scurried at our approach; along the hedges where birds were twittering and flitting; under trees where walnuts and pecans were dropping, watched the crows, homeward bound, and the buzzards lazily sailing in the blue vault of heaven. We were in no hurry. We took our time. We walked when we wished and we rested by the wayside as we desired. We communed with nature – at peace. On our return we found our self near an old abandoned graveyard. Did you know we had an old abandoned graveyard almost, if not quite, within the city limits? Yes? No? Well, we have. Many of us know of it. But more of us do not. It had been perhaps 40 years since the writer, as a barefooted boy, was in that graveyard. It lies about four hundred yards a little southwest of Finch Park. It is on top of the hill. A beautiful (or was) location for a "silent city." It is the (or what is left) Bradley graveyard. In it was buried members of the Ed and T. T. Bradley families and many others of the early settlers, who died prior to 1876. But it is abandoned now. All the bodies except about half a dozen that could be located, or who had relatives to move them, were taken up about 20 years ago and re-interred in Pecan Grove cemetery. We do not think anybody has been buried there since that of Uncle Tom Bradley, who died in 1876. The Bradleys owned hundred of acres of land in and adjoining our city. And if you will look at your deed, you will perhaps note that it is out of our original Ed Bradley or T. T. Bradley survey. Well, these were pioneers. Long have they been sleeping and their bodies have returned to the dust of mother earth. We remember Uncle Tom Bradley. He lived just west of the late home of Mayor Finch in an "old timey" house, which as the property of Mrs. S. H. Buck was torn down several years ago after having stood the blasts of 60 winters. As we walked slowly along the dust road we happened to catch a glimpse of what looked like a tombstone. Then the flood of memories of the long ago went through our mind and we recalled that that was the old graveyard that we had visited with companions over 40 years ago. The laying out of the streets, and building of homes, and Interurbans, and pikes had changed the topography of the land. But the thicket looked familiar, and we decided to investigate. Tired and homeward bound. But we were in the bond. So we climbed that hill and ? slope within the sacred precincts. It is a grass and cow pasture now. No fence protects the graves. Here and there (were graves?) long since opened graves now about filled. An occasional wrecked yard fence that had protected someone's grave and half a dozen tombstones roughly hewn from sandstone and discolored with age – fallen partly or entirely down and in some instances broken off. We took from the inscriptions, verbatim, as follows. "In memory of Sallie Ellender Bell. Was born June 17, 1823 – Died Dec. 3, 1858." Hence was 35 years of age. That was 63 years ago. T. T. Bradley. Born Oct 13, 1824. Died Feb 19, 1881. Aged 57 years." That was 40 years ago and was perhaps the last one to be buried in that graveyard. "In memory of Louise Bradley. Born Sept. 19, 1832. Died Oct. 16, 1865." Hence was 56 years old. "In Memory of Edwin Bradley, who departed from this life in the 68th year of his age, September the 24th 1855." That was 66 years ago. "Sarah Jane Bradley, wife of T. T. Bradley; born Oct. 14, 1845. Died July 19, 1876. Aged 31 years." " A. M. Avern, Born Feb. 15, 1826. Died April 10th, 1856." Hence was 30 years old at time of his death. "In memory of David Maclay, M. D. Died Aug the 24th, 1858. Aged 33 years." At bottom of the tombstone was a Masonic square and compass. "Samuel H. Dews. Born in Nelson county, Kentucky. Aug 26, 1820. Died Nov 3, 1869 Was 40 years of age." That was 52 years ago. "In memory of Susan R., wife of M. R. Parrish, Born June 14, 1836. Died July 19 1861. Aged 25 years." By the side of this grave was a little stone on which was inscribed: "In memory of Charlie D., son of M. R and S. R. Parrish born July 8, 1861 Died Oct 11, 1861." The young mother had given her life to the babe whose little body soon follow her to the lonely graveyard on the hill. "My mother, Charlotte Cooper, Born Feb 1st, 1798. Died May 13, 1871. Aged 73 years, 3 months, 12 days." By her side was the grave of "Milton Cooper. Died Dec 18, 1855; aged 53 years." Man passes from life, to his rest in the grave. The leaves of the oak and the willow shall fade. Be scattered around and together be laid. Shall moulder to dust and together shall lie." 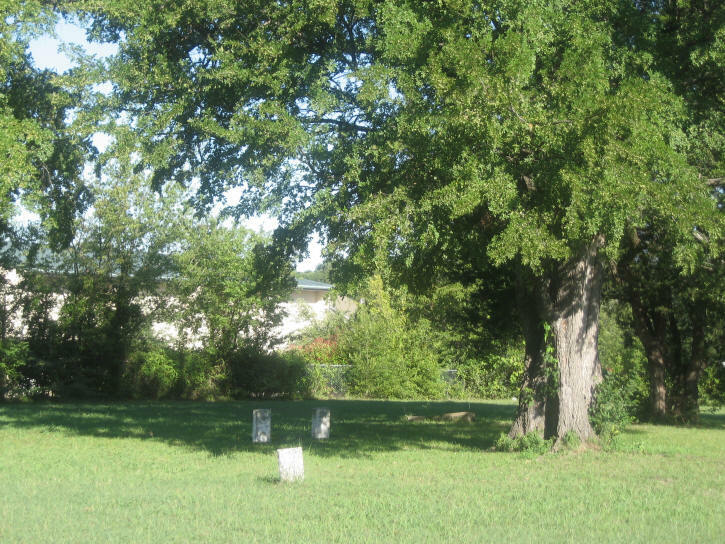 This cemetery is about 1 mile east of McKinney High School. At present there is no pullover for the cemetery and historical marker. The cemetery is shown on Plat map F-366 and is for .6 acres in the Park Place subdivision. It is not shown on Rand McNally maps. 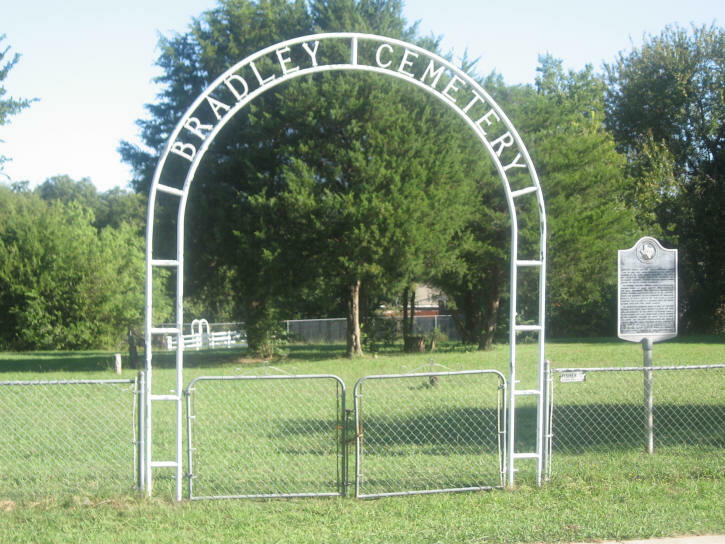 The Bradley Cemetery is one of the first ones in the city of McKinney. It was started in 1855 with the burials of Edwin (Edward) Bradley and Milton Cooper. The cemetery is fenced and covers 150' x 200'. There are relatively few marked graves. It is said that there are about 100 graves. According to the historical marker, several graves were marked with wooden stakes and there was a slave cemetery in a wooded area with the graves marked by bois d'arc stakes. The land is referred to at various times as Kirkpatrick's pasture, Waide's pasture, and Schubert's pasture. The cemetery was neglected for many years. It is currently being maintained by descendants of the Bradleys. In 1906 the Texas, New Mexico, and Pacific Railway was supposed to construct a track through the cemetery connecting McKinney with the west. Eleven bodies were exhumed. The railroad was never built. Four of the people who were moved were Milton Wilkerson, his daughter - Mrs. Laura Hocker, and 2 of his grandchildren - children of Mrs. Pack O'Brien. They were re-interred next to another daughter, Mrs. J. A. Massie, in Pecan Grove Memorial Park. From a newspaper article in the McKinney Democrat written November 24, 1921, and from a list made by Capt. Roy Hall in 1965, the following additional people are known to be buried in the cemetery. When Wilson Creek Parkway was built, several people met to try to determine the boundaries of the cemetery. It was unclear how large it was and there were no bois d'arc posts standing. Boundaries were established for the known part of the cemetery. Several black officials met to see if there was a way to determine the boundaries of the slave portion of the cemetery. The boundaries could not be determined and the city was given the go-ahead to build the Parkway. It was agreed that it was sufficient to mention the slave portion on the historical marker. I have heard that remains have been uncovered outside the fence when the housing project expanded there. ALONG SURVEY T. M. M.& P. R.R. Some Have Been Buried Over Forty Years. Bones in Fairly Good State of Preservation. McKinney Democrat, April 26, 1906 Tuesday’s Daily. “In memory of Edward Bradley who departed from this life at the 68 year of his age September the 24, 1855"